안채 대청에 적힌 상량문에 의하면 고종 3년(1866)에 지은 집이다. 논밭이 완만한 경사지에 남향으로 자리하였다. 한단 높은 'ㄷ'자형 안채와 한단 낮게 지어진 'ㄷ'자형 사랑채가 맞물려 'ㅁ'자 평면을 이루고 있다. 안마당은 정사각형인 듯 반듯한 폐쇄성이 강한 평면이다. 문을 들어서면 앞면에 사랑채가 안채를 향하지 않고 문쪽으로 향하여 자리잡고 있다. 가운데는 몸채이고 안채쪽으로 꺾어진 좌우 1칸씩은 날개에 해당한다. 몸채는 대청과 아래·윗방으로 되어있고 앞에는 툇마루를 놓았다. 양 옆 날개부분은 곳간과 방·함실이다. 안채 역시 몸채와 날개부분으로 되어 있는데, 몸채인 넓은 대청과 안방이 남향하여 위치한다. 안방과 대청을 모두 남향하여 배치한 것은 경기도·황해도·충청도 등 중부지방에서 형성하는 평면구성이다. 안채의 오른쪽 날개부분은 길다란 부엌이 배치되었고 그 옆의 샛문간은 사랑채와 연결이 된다. 왼쪽 날개부분은 상방과 부엌 그리고 사랑채 곳간과 연결이 되는 중문간이 있다. 안마당에는 우물, 뒷동산에는 장독대가 있으며, 뒤뜰에는 향나무·감나무·대추나무 등이 알맞은 자리에 자리잡았다. 고전적인 기법으로 만들어진 이 집은 현존 상태도 비교적 양호한 편이며, 그 일대에서는 드문 ㅁ자형 평면을 지니고 있어 지정·보존하고 있다. 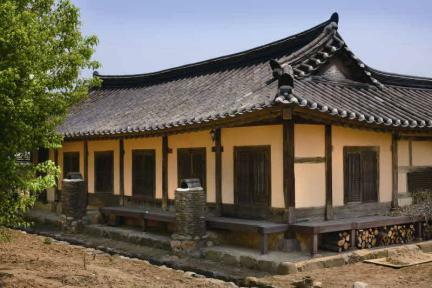 According to the record found from the daecheong (main wooden floor) of the anchae (women’s quarters), this house was built in the 3rd year of the reign of King Gojong of the Joseon Dynasty (1866). It sits on a moderate slope, facing the south. 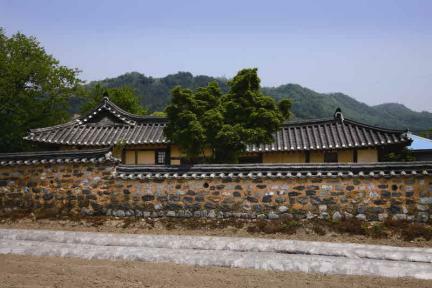 The anchae was constructed on a higher foundation, and the sarangchae (men's quarters), on a lower foundation, forming a square-shaped house. The courtyard has a square shape, giving a closed feeling. When one walks through the gate, one sees the sarangchae in the front facing the gate, not the anchae. The sarangchae has the body at the center and the left and right wings bent toward the anchae. 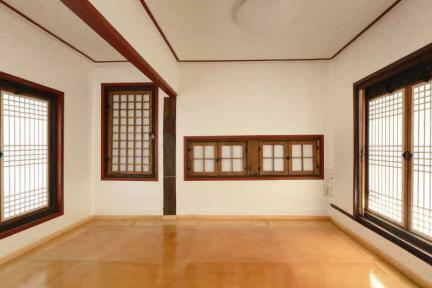 The body consists of the daecheong and two rooms with toenmaru (wood-floored veranda) in front of each room. The two wings consist of storage shed, rooms, and underfloor heating furnace. The anchae also consists of the body and wings. 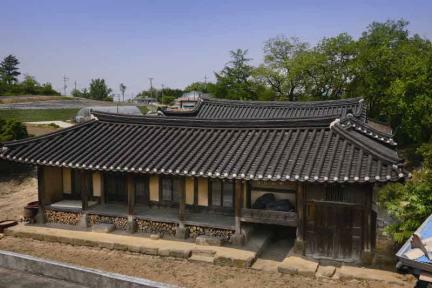 The body has a wide daecheong and the anbang (main room) facing the south. Arranging the anbang and daecheong to face the south is a typical layout that can be found in the central regions of Korea, such as Gyeonggi-do, Hwanghae-do, and Chungcheong-do. 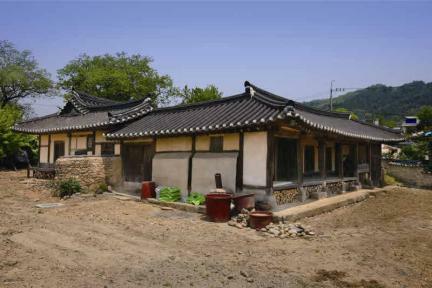 The right wing of the anchae has a long kitchen. A side gate wing in front of the kitchen is connected to the sarangchae. 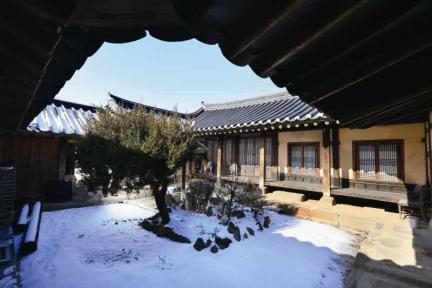 The left wing of the anchae has a room, a kitchen, and the middle gate connected to the storage shed of the sarangchae. There is a well at the courtyard, including terrace for storing crockery for sauces and condiments on the back hill. Junipers, persimmon trees, and jujube trees are planted in the backyard. This house has been preserved in good condition. Because of its rare “open square”-shaped layout, it is designated as important cultural heritage to preserve it. ※ Viewing of the cultural property above is usually available anytime but may be limited depending on the owner’s personal circumstances.